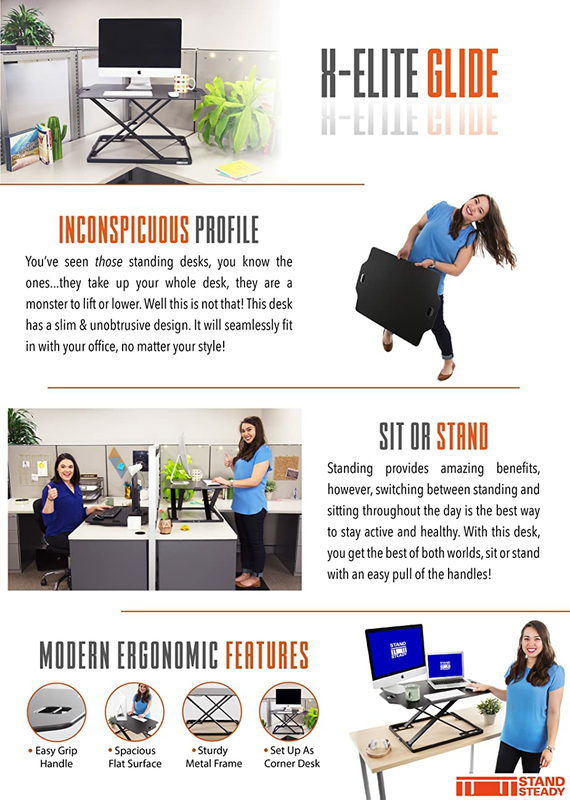 The word is out that standing at your desk is great for your health and relieves your constant back pain from sitting. But, you want a desk riser that's slim, lightweight, and keeps a low profile. At Stand Steady we aim to please! Like all of our X-Elite models, the X-Elite Pro Glide Standing Desk Converter is a great way to turn any desk into a standing desk. It's also sleeker, slimmer, and easier to move and store. Check out our video below! AWARD WINNING X-ELITE: We have upgraded our customer favorite X-Elite Pro with a newer slim and lightweight design. 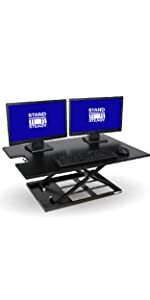 Introducing our newest standing desk converter, the X-Elite Pro Glide! 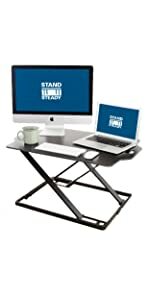 ERGONOMIC SIT OR STAND: Your new desk riser adjusts from 1.5” for sitting and up to 16” above the desktop when standing! It’s perfect for anyone up to 6’ 2”. SPACIOUS SURFACE: Your new standing desk is totally slim – but it’s also strong and durable with a large surface (31” x 21”). You can load your desk with up to two monitors (or a laptop and monitor), keyboard, mouse, phone, and coffee! SLIM & SLEEK MODERN PROFILE: Your new stand up desk is a perfect fit for your home office, corporate office, cubicle, or corner cube desk! With its slim design, it lays flat at 1.5” perfect for lowering to the sitting position and easy to store! BEST standing desk converter EVER!! I use a standing desk because of back pain due to car accident, had a cheap plastic thing, but it finally broke. I need a standing desk converter because I need most of my desktop to be fully functional in that I can use most of it's flat surface for work that I need to do sitting down, LOTS of audited hard copy report comparison. I bought the X-Elite Pro Glide One Level Standing Desk Converter for all of it's advertised attributes. 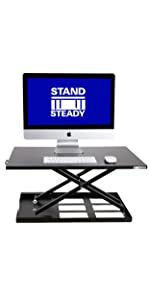 I LOVE this model of Stand Steady for many reasons. It is the perfect size that I can put it off to the side of my desk and still have 2/3 of desk for regular usage as described above. 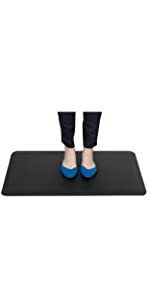 It is very sturdy for the lightweight design, does not wobble at all, glides up and down very easy with little effort, just a little pull up and push down is needed. It's sleek design, being so close to desktop when down, makes it so that I can use it as part of the desk, another great feature. It's design is so perfect I am able to accomplish standing most of the day, but then a smooth transition to sitting for that work described above. Others in my office have a different model of Stand Steady and when they see mine they are gonna want it :-) Thank you Day for inventing this desk converter. It is wonderful!! This is our fourth standing desk converter and very satisfied. I like the fact that it is ready to go right out of the box - no assembly. I have used twice so far and have no complaints. So glad I didn't have to assemble. That's a prize in itself. Again, so far so good. Thanks Stand Steady. I had looked a long time for a standing desk option, and am very pleased with the Glide. Easy to operate and very low profile when lowered, so it looks and feels more natural on my desk than most.